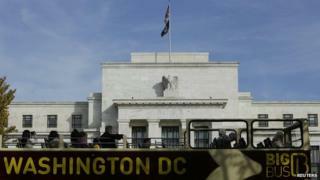 The US Federal Reserve is expected to announce the end of its quantitative easing (QE) programme later. The Fed's main policy making committee is meeting in Washington, where it is discussing whether to stop buying financial assets with newly created money. It has been gradually cutting back the scheme, which began in 2008, since late last year. The markets are expecting that the asset purchases will finally cease. If they are right, it will mark the end of an extraordinary experiment in economic policy. It started in November 2008 amid the financial crisis and fears that the US, and the rest of the world, might be facing another great depression. The Fed's traditional ammunition, cutting interest rates, was running low - there was one more cut the following month, taking the main interest rate target down to practically zero. So it began buying financial assets and creating new money to pay for them. In total, the Fed has added $3.7tn worth of assets to its holdings, about an eightfold increase. It certainly didn't prevent a recession; nor did it generate a particularly strong recovery. But senior Fed officials argue that it prevented a much worse downturn and they say unemployment is lower and economic activity higher than they would otherwise have been. As unemployment has come down - now below 6% - so the case for continuing QE has weakened. The Fed has been cutting back the monthly purchases of assets for nearly a year and the final step is expected at the meeting in Washington. But Fed policy is still far from normal. All the extra money created to buy those assets is still out there in the banking system - though it hasn't really filtered out into the wider economy. And the Fed's main interest rate target is still just about zero. The improvements in the US economy are real enough. But the moderate unemployment rate does not tell the whole story. The end of QE, assuming it does indeed come, will nonetheless be an important milestone in the repair of the US economy.